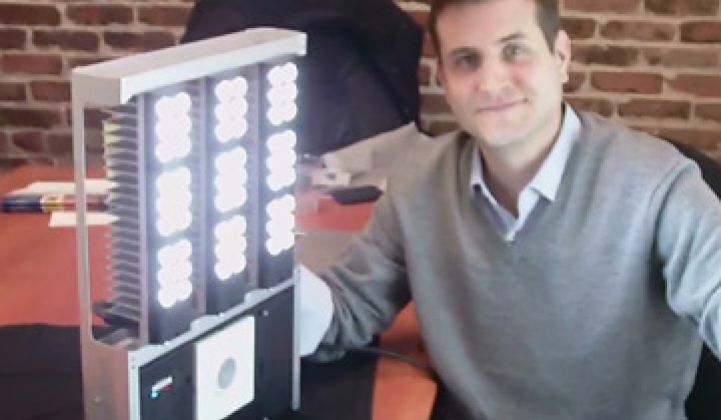 The LED company wants to expand its footprint with a new round of funding. Digital Lumens has raised $10 million in Series B funding along with a new working capital line of credit. The funds will be used to expand product development, increase international sales and distribution and continue to lead the field of LED lighting systems, according to a statement released on Tuesday. The investors include Black Coral Capital, Flybridge Capital Partners and Stata Venture Partners, which have provided a total of $25 million to the Boston-based company. The funding is important because it underscores the need to network lights. Additionally, expect to see acquisitions soon. We've predicted this for a while, but now sources tell us some are about to drop. Digital Lumens wants to change high-intensity discharge (HID) lighting -- those hot 400-watt lamps you see at stadiums and in warehouses -- through a combination of software, LEDs and networking. The company has devised an overhead LED spotlight that consumes only 165 watts but puts out 11,000 lumens. The spotlight, which contains a motion sensor and a ZigBee mesh networking module, communicates with the company’s LightRules software to turn the lights down or off when they aren’t needed. Together, the combination leads to an 88 percent reduction in light power, according to founder (and ColorKinetics alum) Chemel. About half of the savings come from the LED itself and the other half comes from the networking. Chemel is currently touring to show off the company’s fixture and a new version of the LightRules software. The payback takes two years or less. As an added bonus, the company’s light fixtures can also reduce the power consumed by air conditioners and chillers in cold storage warehouses by 20 percent to 40 percent. Unlike traditional HID lights, the light from LED spotlights is not warm. The LED chips themselves emit heat, but from the back, or in the opposite direction of the chilled food. Over time, Digital Lumens hopes to move into the market for lower intensity streetlights and parking garages, a market now being pursued by Cavet Technologies. HID lighting is a niche, but it’s a big one. Approximately 60 million to 100 million fixtures exist in the U.S. alone. LEDs for business will be a $1 billion market by 2014, according to a report from Groom Energy and GTM Research. Groom Energy, which provides commercial energy solutions -- including generation and efficiency upgrades, such as LEDs -- also announced an additional $2.6 million equity investment on Tuesday. Most HID lights can’t be dimmed and most of the time they aren’t turned off because on/off cycles cause the electrode to splatter and accelerate the aging process. “This is the dirty little secret of HID,” Chemel said. Both Metrolight and Lumetric have released HID dimmers, but both companies combine their technologies with traditional HID lamps, not LEDs. Both approaches have their merits. LEDs consume less power, but distributors and installers are more familiar with traditional HIDs. LEDs also cost more, although prices are dropping. Another twist: Digital Lumens' network technology now only works with its lights. Then again, since most installations will occur with new construction or retrofits, it will be fairly easy for contractors to standardize with one kind of light. Which approach will win and in what time frame still remains to be seen.